Both explorers set out in small wooden boats, using unreliable methods of navigation in search of new lands and new trading partners. Overcrowded and unhygienic conditions, long monotonous months at sea, poor diets and harsh punishments made life a mental and physical ordeal for Tasman's and Columbus' crews alike. Most interestingly both men misconstrued their own discoveries. When Columbus first sighted the Bahamas in 1492, he thought he had reached China, while in 1642 Tasman wrongly identified the west coast of New Zealand as part of the unknown southern continent. 45c - Abel Tasman / Heemskerck. 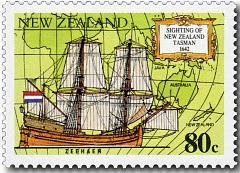 80c - Abel Tasman / Zeehaen. On 14 August 1642 Dutch sailor Abel Tasman sailed west from Batavia (Indonesia) for Mauritius, with the 'Heemskerck' and 'Zeehaen'. As leader of the expedition, his objectives were to explore New Holland (Australia), to search for the mysterious 'southern continent' and to find a trade route to China. Tasman managed to circle Australia without being aware of it but reached Tasmania, which he named Van Diemen's Land. 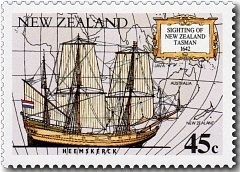 He sighted the northern tip of the west coast of the South Island of New Zealand on 13 December 1642. After Tasman dropped anchor to replenish the ships' water supplies, four sailors were killed when they were intercepted in their rowboat by a Māori war party. Tasman called the area Murderers' Bay (now known as Golden Bay). Fear of hostile Māori kept Tasman from setting foot on New Zealand during the remainder of the journey along the west coast of the North Island. $1.00 - Christopher Columbus / Santa Maria. $1.50 - Christopher Columbus / Pinta & Nina. 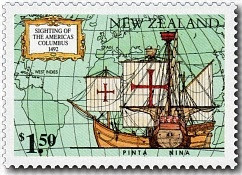 On 3 August 1492 Columbus set out from Palos in Spain with the 'Santa Maria', the 'Nina' and 'Pinta', believing he could sail to Asia by heading west. 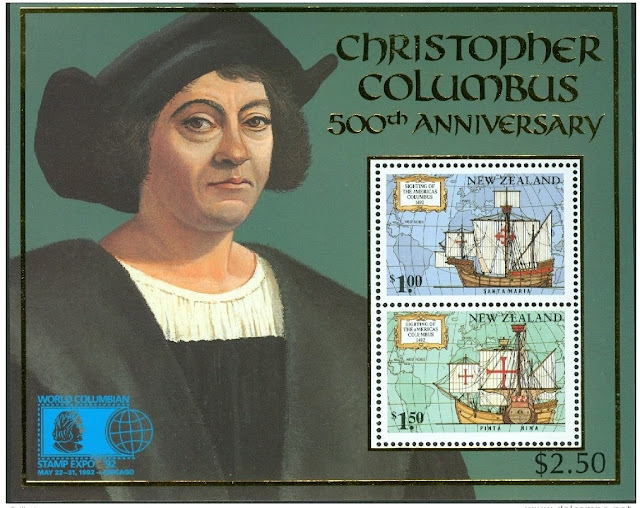 Columbus, who captained the Santa Maria, had convinced the Spanish rulers that the north-east trade winds could be relied on to carry his fleet safely to distant quarters of the globe. His first glimpse of the Americas, on 12 October 1492, was an island in the Bahamas, probably Watling Island (now known as San Salvador). 1992 Navigators - First Day Cover. 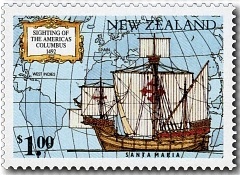 New Zealand attended the World Columbian Stamp Expo in Chicago in 1992 producing a miniature sheet incorporated two stamps from 1992 Navigators stamp issue with a background design illustrating Christopher Columbus. These stamps remained on sale until 12 March 1993. 2017 Ross Dependency - Historic Huts. 2007 50th Anniversary Scott Base.